Patella dislocations are far more common than we previously thought. Many people assume that an athlete who feels a pop during an injury has torn their ACL. It is now clear that a certain percentage of these athletes have dislocated their patella. These injuries are just as painful as ACL tears, and they require urgent attention to be sure that the athlete has the best chance at returning to sports. You turn or twist and try to accelerate rapidly to the ball. Your knee lets out a loud pop. You are on the ground, you can’t walk, and you are wondering what you just injured in your knee. A pop felt during sports could mean that you dislocated your patella or kneecap. Many knee injuries cause a snap or a pop. Most of us think of ACL tears when we hear this story. But patella, or kneecap dislocations are also very common. The kneecap or patella floats in position in the front of your knee. It travels up and down in the femoral groove and is held in place by muscles and ligaments. After a severe twisting injury the kneecap can dislocate and come out of its groove. After being carried off the field, what are your next steps? Turning and twisting during sports puts a lot of stress on the kneecap. What most people are not aware of is that many athletes who felt a pop in the front of their knee during sports actually had a dislocated patella. The kneecap is also called the patella. A patella dislocation occurs when the bone slides out of a groove which normally holds the kneecap in place. A dislocation of the kneecap can lead to long term issues such as recurrent dislocations, cartilage injury or arthritic change. The treatment of a kneecap dislocation and whether or not surgery is necessary will depend on many issues which we will discuss here. The kneecap or patella is an oval shaped bone that sits in a femoral groove on the front of the femur. The femoral groove is called the trochlea. The kneecap stays in the trochlea groove because of two ligaments which try and prevent it from slipping out. The ligament which appears to cause the most trouble is the medial patellofemoral ligament or the MPFL. If the MPFL is stretched or torn, then your kneecap can dislocate. After a traumatic sports injury the MPFL is usually torn. When the MPFL is torn, the patella has lost a critical support to stop it from dislocating towards the outer side, or lateral side of the knee. Why Did My Kneecap Dislocate? the anatomy of your bones – specifically the femoral (trochlea) groove and how deep the groove is. the quality of the ligaments(MPFL) that hold the patella in place. All of the above contribute to hold the kneecap in place. 1.Your quadriceps muscles need be strong and well balanced For that matter, so do the muscles of the hip and pelvis. If those muscles are weak, they will affect the stability of your kneecap. For example. Weak hip muscles allow your femur or thigh bone to externally rotate (rotate outward). 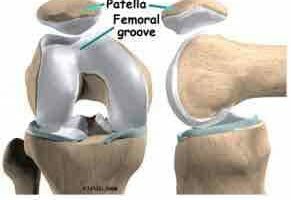 That can put the patella in an at risk position to jump out of the femoral groove. 2. Discussing the anatomy of your kneecap and the femoral groove that it sits in is a difficult topic to understand. Many people have a femoral groove on the femur that isn’t very deep. That’s how you were born. If that femoral or trochlea groove is not very deep we refer to it as being “dysplastic.” Many of you who have your MRI reports may notice that it states that you have mild, moderate or severe “trochlea dysplasia”. Trochlea dysplasia means that the groove on the front of your femur isn’t very deep, or perhaps it is completely flat. Trochlea dysplasia can have a significant influence on whether or not you are at high risk for recurrent patella dislocations. In addition, if you have had more than one patella dislocation, the presence of trochlea dysplasia can affect our decision making about which surgical procedure might be best for you. 3. The MPFL or the medial patellofemoral ligament is the most important structure when it comes to determining why your kneecap dislocated. Certain people have loose ligaments. In those instances, a loose MPFL can let the kneecap jump out of the groove and dislocated. In sports, the MPFL is usually torn due to injury. After an injury on the field the MPFL likely tore when your kneecap dislocated. If the MPFL is torn, then the patella will be at risk of dislocating again in the future. In the picture below, the MPFL has torn and that has allowed the patella to dislocate over onto the lateral side of the knee. How did I tear my MPFL ? The MPFL can tear because of two different types of injuries. These can be contact or non contact injuries. Contact injuries imply that you were running and your kneecap was struck or hit by someone. If you are struck on the inside of your kneecap then the MPFL might tear, thus allowing the patella to slide out of place resulting in a dislocated kneecap. The more common injury is that your knee was bent when you twisted and tried to turn and run. That puts a lot of stress on the MPFL, and can cause it to tear. So, similar to ACL injuries there are contact and non-contact injury mechanisms. We know that most ACL tears in the knee occur due to non-contact twisting or pivoting injuries. The same is true for kneecap or patella dislocations. Interestingly, most people who have a patella dislocation will not notice that the patella is out of place. That is because the kneecap will often reduce or move back into place right after the dislocation. This is known as a spontaneous relocation or reduction where the patella came out of place and then immediately went back into place. Some of you may notice that the kneecap is out of place. These are very obvious injuries because the front of your knee just looks very strange. In those cases your Athletic Trainer or an Emergency Room physician will put the kneecap back into position with a big push. How Do I Treat My Dislocated Kneecap? The initial treatment of a patella dislocation is to have the patella reduced. This should be done on the field by the Athletic Trainer or sideline physician. Once the patella is in proper position you will require an Xray to be sure there are no fractures present. You will need crutches and you will likely need an MRI to be sure that you did not injure the cartilage when the patella slid out of place. How we proceed after the initial treatment will depend on whether or not this was your first patella dislocation or whether or not you have now had more than one patella dislocation. Most people with more than one kneecap dislocation will require surgery. Very few people will need surgery to treat their first patella dislocation. The treatment for a dislocated kneecap will depend on what parts of the knee were injured when the patella came out of place. When you dislocate the kneecap you usually tear a ligament (MPFL) which holds the patella in place (Read below for MPFL reconstruction discussion). After a traumatic patella dislocation we have to obtain an MRI. The MRI will not only show if the MPFL has torn, but it will show if you also injured the cartilage on the patella. Many athletes will also injure the cartilage on the patella. Many cartilage injuries are small, and do not require treatment. Some cartilage injuries are larger and may require a repair to to decrease the risk of developing osteoarthritis. This may be your first kneecap dislocation… and for others you have now had two or three dislocations. Depending on what structures you have injured and how many dislocations you have had will determine what your doctor will tell you regarding your treatment options. In athletes with more than one patella dislocation surgery is often advised. 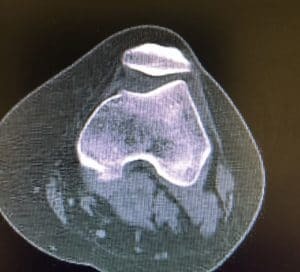 The type of surgery needed to stop your patella from dislocating will depend on your anatomy (as seen on the MRI), and the integrity of the MPFL. Most people who dislocate their kneecap notice that the kneecap is not out of place. It spontaneously reduced. If you felt the knee pop and your knee looks distorted or strange then your kneecap is still dislocated. That will require a trip to the emergency room if you do not have an Athletic Trainer to put the kneecap back into place. The sooner the kneecap is reduced the better. Your knee will swell a lot after a patella dislocation. This is due to bleeding. The bleeding will stop, but it will take a few weeks to get your normal motion back. A physical therapist or Athletic Trainer will be very important as a guide. Sometimes we will aspirate or remove the blood from the knee, but that is not always necessary. If you suspect that you had a dislocated kneecap is very important that you see a Sports Medicine Doctor. Many different injuries can occur after the dislocation. We will need to check to make sure that you did not damage the cartilage on the kneecap or the femur. Some cartilage injuries can be severe and require treatment sooner rather than later. We will also be able to determine if your MPFL is torn. An MRI is almost always necessary after a kneecap dislocation. 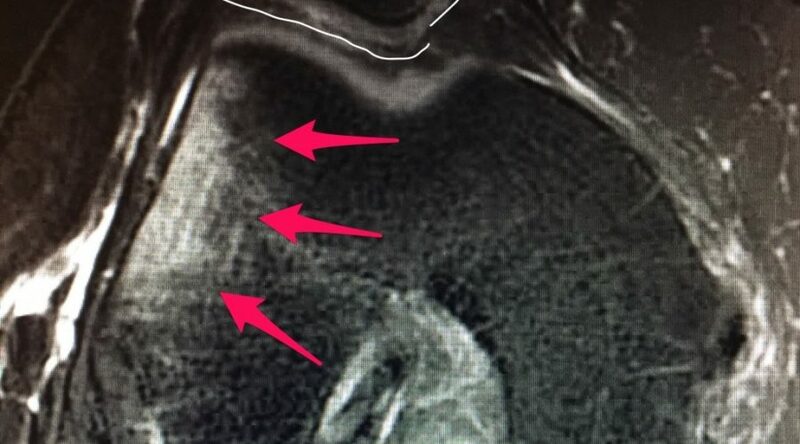 The MRI will show if the cartilage has been damaged. The MRI will also show if the MPFL is torn, and it will also tell us about the anatomy of your bones. That means that we can tell how deep the groove is that the patella sits in. Using the information from the MRI and from our examination we can determine your risk for a second or third dislocation. The recovery time from a kneecap dislocation will depend on whether or not this was your first dislocation or your second or third. Your recovery time will also depend on whether or not you have injured the cartilage on your kneecap or patella. If this was your first patella dislocation and you do not have an injury to the cartilage then we usually start your physical therapy soon after the injury. Most people who have had their first patella dislocation will not require surgery. Many athletes will be able to return to sports within 6-12 weeks after therapy has started. If this was your first dislocation and you did have a cartilage injury then you may require surgery to repair the cartilage. That recovery process will take 4-6 months to allow the cartilage to heal. If you have now had more than one patella dislocation then you will need to consider surgery to repair or reconstruct the MPFL ligament which holds the kneecap in place (see below). Recovery from MPFL ligament surgery can take 6-10 months before considering a return to sports. There are other procedures available to stabilize the kneecap to prevent further dislocations. The MRI will help to guide us in determining which procedure is necessary to give you the best chance of having a stable patella. Does a kneecap dislocation require surgery? Surgery for patella or kneecap dislocations can be tricky. After you have had more than one dislocation you will likely need surgery to stop the kneecap from dislocating again. The type of surgery you need will depend on your physical examination and it will depend on your xray and MRI findings. Many unstable kneecaps can be repaired with surgery to fix or reconstruct the MPFL ligament alone. If you have other issues which show up on your MRI then we may need to consider additional procedures to repair your kneecap to prevent it from dislocating again. Was this your first dislocation ? Does the cartilage need to be repaired? Does your bone anatomy affect your risk? Most people who have had only one dislocation and do not have any cartilage damage do not need surgery. You will be rested to let the MPFL try to heal. Then you will be placed into physical therapy to rehabilitate the knee. If you have a repairable cartilage injury then we will likely suggest surgery to repair the cartilage, and repair the MPFL ligament at the same time. 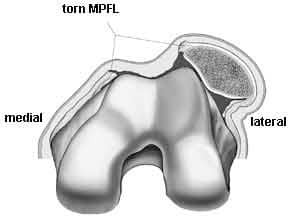 The MPFL is the ligament in the knee which holds the patella or kneecap in its proper position. It is the ligament which prevents the kneecap from sliding out laterally and dislocating. If you have had recurrent patella instability, eg. you have dislocated your patella more than one time, then your MPFL is not working or has stretched out too much to function well. 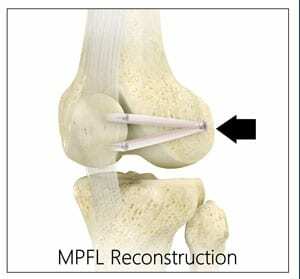 In order to restore stability to your kneecap we need to consider an MPFL reconstruction. During an MPFL reconstruction we will recreate the ligament which will stop the patella from dislocating. In the picture below you will notice that the MPFL is attached to the kneecap and it is attached to the thigh bone or femur. During surgery for an MPFL reconstruction we will create a small hole in the femur. That hole will be in a very specific place. We determine where that place is by using a special x ray machine during the surgery. Once we determine where the hole is we will place your new ligament into that hole and secure it there with a screw. Now that the new ligament is attached to the femur we need to attach it to the patella. The new MPFL should have at least two attachment points on the patella. We will usually stitch or suture that new ligament against the patella. Overtime that new ligament will heal to the femur and the patella. For those of you considering surgery for a patella dislocation your choice of surgeon is very important. Not many surgeons have the experience necessary to maximize your chance of success. This can be a very challenging surgery for many people. After your MPFL surgery you will need time to allow for the pain and swelling to diminish. We will brace your knee for a few weeks to limit how much you can bend it. Within two weeks we will start your physical therapy. You will not be able to bend the knee beyond 90 degrees for two-three weeks. We will then allow your physical therapist to start more aggressive rehabilitation. It will take 6-10 months to recover from an MPFL reconstruction and be able to consider a return to sports. Trying to return to sports too soon following MPFL surgery will put you at risk for developing another injury because your new ligament might stretch too much. If you have had more than one kneecap dislocation then you will need to consider surgery to repair or reconstruct the MPFL (medial patellofemoral ligament) in order to minimize the risk of another dislocation. Each time your kneecap dislocates there is a risk that you will damage the cartilage. It is therefore a good idea to repair the kneecap to prevent further damage after your second dislocation. We created this video which helps you understand our decision making when we consider which operation might be best for your dislocated kneecap. In future posts I will go into more depth about the various surgical techniques used to prevent the patella from dislocating again. This is a very complicated process. Be sure that you are seeing a physician who is very experienced in managing kneecap or patella dislocations. What is Patella Subluxation ? Is it reasonable to think that a mobile top college QB, like Dondre Francois, can be at 100% within 12 months following patellar tendon repair surgery? Also, would you expect there to be little difference between the recovery rate of a top NFL skill player (receiver like Victor Cruz), and a top running college QB for this specific surgery requiring injury? Would the level of play (speed, cuts, weight etc.) have much if any difference with the exact same injury on an NFL skill guy and a top college skill guy (QB) in the length of time to recover and the expected attainment of full capacity prior to the injury? My reason for asking is there is information online about NFL players with patellar tendon tears and much research that concludes only 50% or the surgeries are successful and it’s tough to recover to full strength. It is difficult to return to 100% of prior capacity after a patella tendon repair. It is possible to get awful close and to return to elite level sports, but it will take 12+ months and a ton of work in the gym. The issue is not that the patella tendon surgery fails… the tendon heals well in the majority of these cases. The issue is that it sometimes isn’t possible to achieve 100% of strength and agility following a repair. There are many psychological issue which also affect an elite athlete’s ability to return to sports after a major injury. Sometimes it is hard for them to shake off the thoughts that they can be reinjured, or the thought that they are “damaged” or “brpken”. That leaves them at risk for not be able to perform due to fear, apprehension, etc. This is the most informative writing I have read on patellar dislocations. Thank you for this information. I dislocated both of my kneecaps when I was thirteen and received very little help for ten months. I was young and my injury was not taken seriously. I did not receive an MRI for eight months. I was in a wheelchair for most of that time because I would experience frequent patellar subluxation that increased with my prescribed physical therapy. I dislocated my left knee again and now had to move a small bone piece the size of a dime in between my patella and trochlea groove(which I now know is dysplastic) in order to bend or straighten my leg. I finally got the MRI which showed a torn Medial Patellofemoral Ligament, a contracted Lateral Patellofemoral Ligament, and a piece of bone wrapped in fragmented tissue. I had surgery and have recovered relatively well though I no longer do sports or get in situations that could put strain on my knees as I have had a few slight subluxation in the eight years after surgery. I have let this experience change my life in a positive way and am now pursuing a Bachelor’s Degree in Cellular and Molecular Biology with the goal to go to Medical School and become a Physician’s Assistant and then an Orthopedic Surgeon. I hope to change the stigma related to women and children’s pain and help all people with equal healthcare and better doctor-patient relation.